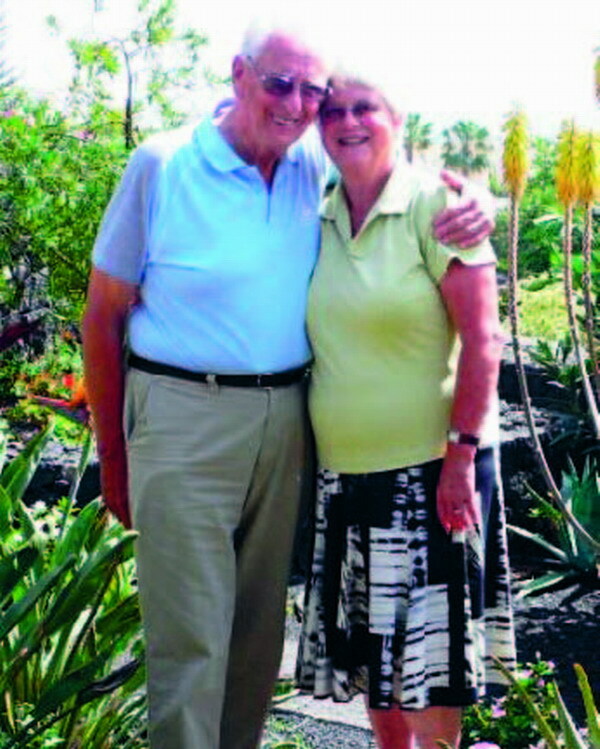 Some may call her ‘Granny Annie’, but a septuagenarian Lanzarote charity worker has found new love af­ter two decades of wid­owhood - with a man 11 years her senior! Ann Squire, from Güime, stunned family and friends on announcing a sudden engagement to 83-year-old retired Scottish traffic cop Ian Cameron, whom she had only just met. Then without further ado, the starry-eyed couple with a staggering combined age of 155 and a massive offspring tally of six children and 17 grandchildren, jetted back to the UK to make arrangements to tie the knot in Middlesex on FA Cup Final day, Saturday, May 17. 26.04.2008 - Ann, 72, who originates from North Devon and is best known here for running her Second Hand Rose charity shop, said Ian’s proposal caught her well and truly by surprise. “It was about 8am and I was still in my nighty when I answered the phone to Ian, who said he thought it was right we should get married. He told me he wasn’t going to continue the day until he had popped the question and I said ‘yes’ straight away,” she said. But it’s unlikely everyone will be crossed off the list by the time of the happy day as Ian also has daughters in Australia and Jersey. But this is no problem for the happy husband and wife to be as they are both seasoned travellers. Since marrying ‘the boy next door’ at the tender age of 21, Ann has had spells in Ascension Island, Malta, Arabia, Sierra Leone, Bahrain, Trinidad, Doha and China as her late husband, David, worked for Cable & Wireless and upon retirement became consultant for the new telephone company in Doha, where they lived for 14 years in two spells. Meanwhile, Ian, who spent wartime in Sri Lanka on a well secreted Y station near Colombo, has also travelled widely since retirement. Delighted Ian said: “Ann is the best present I could have received; I wasn’t even looking for a wife at my age!” Ann reflected: “It´s been a good life as I’ve always wanted to travel and Ian likes to travel as well. It’s good that we can continue that together as it’s much nicer travelling with someone than on your own.” Next on the agenda will be the States for a romantic honeymoon and, just for good measure, to attend the wedding of one of Ian’s granddaughters. During this adventure they should also get to see Ann’s daughter-in-law Louise, who is working in Doha as a fabric conservationist. This will be an emotional time in itself as Louise and husband Phil, together with their children Emma, Laura and William, are all survivors of the Boxing Day 2004 tsunami. In another strange twist, Ian’s son-in-law George Larkins, from Australia, is also periodically working in Doha on building projects, and they plan to meet up with him too. Meanwhile, Ann’s other son, also called Ian, who heads a charity team of opticians to various worldwide destinations, the latest being Guatemala, is due to give the wedding talk. Guests are likely to include Ann’s former pastor here Mark Austin, and his wife Julie, who left Lanzarote on April 24. It’s anticipated their six-year-old Canary-born daughter Naomi will be a bridesmaid and that Julie will sing a solo accom­panied by Mark on the gui­tar. And, yes, the groom has promised to wear a kilt - in full Cameron hunting col­ours! Meantime, whenever the dynamic pensioner duo actually return to Lanzarote, they should spend the win­ter months here and go back to Scotland during peak summer. This is to the extra delight of Ann’s friends on the is­land as she had previously planned to ‘sell-up’ and permanently move back to England.